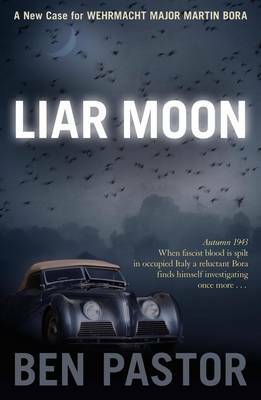 LIAR MOON is the second in a series of books about Wehrmacht Major Martin Bora. The first book LUMEN was set in Poland in 1939, and we have now moved forward to September 1943. The Allies have landed in the south of Italy, the Italian government has changed sides and declared war on Germany, but most of Italy is still occupied by German forces backed up by their Italian Fascist allies. Martin Bora has been seriously wounded losing his left hand and a badly damaged left leg in a partisan attack. A couple of months after the attack, and still suffering the effect of his wounds he is sked to investigate the murder of a prominent Fascist party bigwig, Vittorio Lisi. Heading the list of suspects is Lisi's much younger estranged wife, Clara. "Did De Rosa tell you why they want to keep the murder a secret?" Bora openly grinned this time. "For the same reason why there are no more suicides in Fascist Italy, and people just happen to stumble on the tracks while there's an oncoming train. Perhaps there are no more murders in Fascist Italy, either." Bora, suffering severe pain from his wounds, and Guidi must tread carefully between Germans, Fascist Italians, and partisans as they try to hunt down the convict, and also investigate the complicated life and death of Vittorio Lisi, where the list of suspects grows longer and longer the more they learn. This is grown up crime fiction, and certainly not just another book about Nazis. Ben Pastor has a more literary style of writing, but is still easy to read. Much of LIAR MOON is a study of complex relationships, between Bora and Guidi as the Italian in the course of the story becomes "Polizeikommisar Guidi, mein Freund"; between Guidi and his over protective mother; between Guidi and the beautiful Clara Lisi; between Bora and his wife back in Germany and how she may react to his disabilities; and the story of Lisi and his relationships with numerous women. In one very brief subplot Bora does his best to stop the transportation of a group Italian Jews to the concentration camps, and the author's ability to blend this tragedy with the pomposity of the Fascist Centurion De Rosa, and still make her characters believable is a great skill. "One must always be ready, Major." He stammered an excuse. "Traitors, political enemies, partisans-one must be ready for unforeseen events." Bora overheard a rustle in the bedroom, and assumed that events might include jealous husbands. There have been some fascinating variations on the theme of what happens to ordinary murder investigations and investigators during wartime, for instance Foyle's War on British TV, and the J Robert Janes St. Cyr/Kohler Mystery series. If you want to read a well written crime series that does not shirk the complexities of the moral problems involved in a terrible war, while providing the reader with great characters, good plots, history, an accurate atmosphere, and some thought provoking moments then I can highly recommend the Martin Bora series. Author Ben (Maria Verbena) Pastor was born in Rome but has lived in the USA for over 30 years. She writes in English and there are six more Martin Bora books that hopefully Bitter Lemon will bring us soon. Norman blogs at Crime Scraps Review.